Fairfax, Va.—January 26, 2016 – In a recent study looking at the military’s top challenges working with traditional Command, Control, Communications, Computers, Intelligence, Surveillance and Reconnaissance (C4ISR) systems, more than half of military respondents see interoperability across military organizations as a problem that cannot be solved without the true integration and networking of C4ISR, and agree an integrated approach to C4ISR would provide benefits to military organizations in the forms of agile development, security features and enhanced acquisition. Booz Allen Hamilton partnered with government market research firm Market Connections, Inc. to conduct the survey of military decision-makers, which cited process and budget as the top challenges of working with legacy C4ISR systems. The research also examined the main features of Integrated C4ISR through Enterprise Integration: engineering, operations and acquisition. Two-thirds of respondents (65 percent) agree agile incremental delivery of modular systems with integrated capabilities can enable rapid insertion of new technologies. 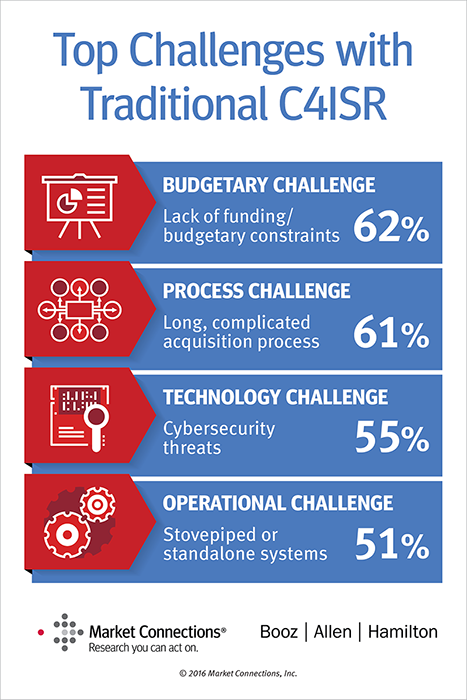 Respondents indicate improving security to protect from cyber threats is a priority for implementation in the next 12 months. Two-thirds of respondents (64 percent) agree designed-in cybersecurity that infuses solutions with organic, unified, multi-layer defense can strengthen security because interoperability will be designed into systems from the beginning. The report is available for download at www.marketconnectionsinc.com/C4ISR, along with a white paper on the benefits of Integrated C4ISR through Enterprise Integration. Booz Allen Hamilton partnered with Market Connections to assess the challenges the military faces with C4ISR and identify which defense commands and decision makers felt an Integrated C4ISR through Enterprise Integration approach would address their concerns and challenges. Of the 250 defense decision makers who participated in the blind, on-line survey, 35 percent were from the Department of the Army, 31 percent from the Department of the Air Force, 23 percent from the Department of the Navy (including the Marine Corps). The remaining 11 percent represented other Defense Department agencies, including OSD, DCAA, DLA, DTRA, JCS, NSA, DFAS DISA and DARPA. A variety of job roles are represented in the sample, with respondents most often describing their role as operations/administration. More than half (56 percent) develop operational requirements and 45 percent manage subcontractors/consultants on projects.